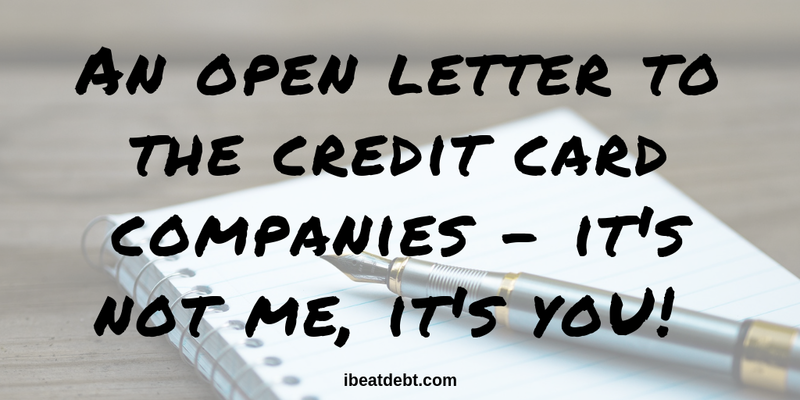 An open letter to credit card companies – it’s not me, it’s you! I know this might not make any difference – but I need to tell you how your behaviour makes me feel. We started off on such a strong footing – everything was great. Having a credit card made me feel like a grown up. It was like a rite of passage. I know you never made me spend the money, but you also didn’t stop me from getting more credit. You never stopped and asked questions when I maxed out one card. You didn’t ask why I was doing a 0% balance transfer from one card to another, and you never asked how I was going to pay off my new (usually larger) balance that you seemed more than happy to give me. I know, I was an adult, I should have known better, but I didn’t. They don’t teach this stuff at school – or they didn’t when I was there. You are the finance industry, you are the experts so I relied on you to know what you were doing and not take advantage. Once I finally realised the scope of my problem – I was in over £8,000 of credit card debt and earning an amount that meant it was almost impossible to pay it off. I was just about making the minimum payments to avoid interest but I was never clearing it. Christians Against Poverty intervened and you and I went on a break whilst I sorted myself out. Thanks to them and some crazy circumstances which I never could have forseen I managed to get out of debt within a year. 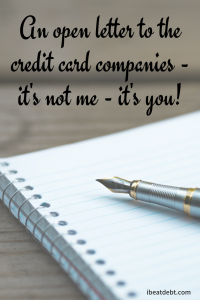 My credit was destroyed – or so it felt. I couldn’t even get a current account. I didn’t want an overdraft, just an account for my own money, but all I could get was a basic account with a cash card. I couldn’t get a sofa from a well known provider on credit and I felt worthless and a complete let down to my family. I’m not blaming you solely for this, like I said, I spent the money – you didn’t put a gun to my head – but you did have a big part in it. I hope you can see this. Years passed by, and I rebuilt everything, from the ground up. I was earning more money, I felt like I knew what I was doing, and wasn’t scared of opening my post any more. After much time and reflection, I decide to get a credit card again. I knew I would have to get one for people with poor credit – but to make my life easier when travelling – when hotels like to have a card on file – I thought it would be the best option. I set up to pay it off in full every month by direct debit as I’d usually put a tank or two of petrol on it a month as well. Debt put me through hell and I was not going there again. We originally started having problems years ago, and credit where it’s due (pun intended) I know you and the industry have been through big changes since then. I thought that maybe things had changed, but in terms of credit cards, I’m not sure the change is enough. I thought maybe you were better than you were, but I need to tell you that you aren’t. What upsets me most now is the willy nilly (frankly there is no better term) approach to unsolicited credit limit increases. It’s not an issue that affects just people with poor credit though. I know many people who have excellent credit, but have completely unaffordable credit limits. One person I spoke to has a total credit limit of just over £26,000 across just a few credit cards and one store card. As they have always had good credit, each account was usually opened with a reasonably sized balance, but all subsequent increases have been unsolicited. They admitted to me that the figure was slightly higher than their net annual salary and that they would be in financial trouble if they got close to the limit of even one of the cards and one has a limit of over £7000 alone. Now the vast majority of these people with good credit ratings (including those I spoke to) are sensible and don’t use them to anywhere near the limit they’ve been given, but it’s hard. It is temptation after all as we live in a society where nice things and nice holidays are looked upon positively and enviously. Also, there no way of knowing what’s around the corner, or what financial difficulties that might arise down the line that might mean they need to use these huge credit limits and end up in even more trouble. I also know of at least one person who didn’t even get the letter about the credit limit increase as it was lost in the post, and didn’t know they had it until they checked their balance. Luckily they hadn’t overspent – but some people don’t monitor their spending quite so closely. 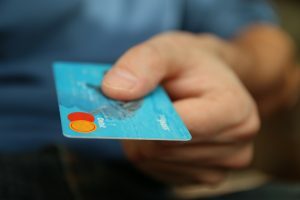 Why do unsolicited credit limit increases even exist? No matter who the person is or what their credit history is, there is no need for them. If someone needs an increased limit for an upcoming purchase or other reason, they should have come to you and ask for one. End of! The only way of proving to me and the rest of the world that the finance industry isn’t just being greedy and actually cares about its customers is to stop this practice. You say these increases “are for the benefit of your customers” but we all know that’s not the case. The FCA need to take onboard this feedback and put their foot down. Things like this shouldn’t be voluntary – they should be compulsory and far more strict. If you agree with me, and are a British Citizen or UK resident – please pop on over to https://petition.parliament.uk/petitions/226160 and sign my petition. I HATE the fact that the Credit Card companies keep increasing my limit. I DON’T WANT IT!! It just makes it easier to give in to temptation… yes I’d love a new kitchen but I can’t afford one… oh wait hang on, I can now because Mastercard have given increased my credit limit by another £5k. Also, if they keep increasing the limit then when it comes to restructuring finance such as mortgages it can make a dent in your credit rating. Thanks so much for reading and supporting! Please share the petition if you feel you are able!